And I really mean GOOD MORNING, because mornings are a lot better when they include any one of these must-try healthy breakfast recipes. Spring is the time when my body starts to say: enough oatmeal already. It’s been cold forrrrever which means I’ve been eating oatmeal forrrrever which means oatmeal has taken over my life. But enough is enough. I am SO ready for summery-feeling breakfasts that feature real foods and keep me really full all morning, like poached eggs with avocado and fresh tomato salad or almond oat crepes stuffed with bananas and drizzled with nut butter and maybe a tiny bit of Nutella. 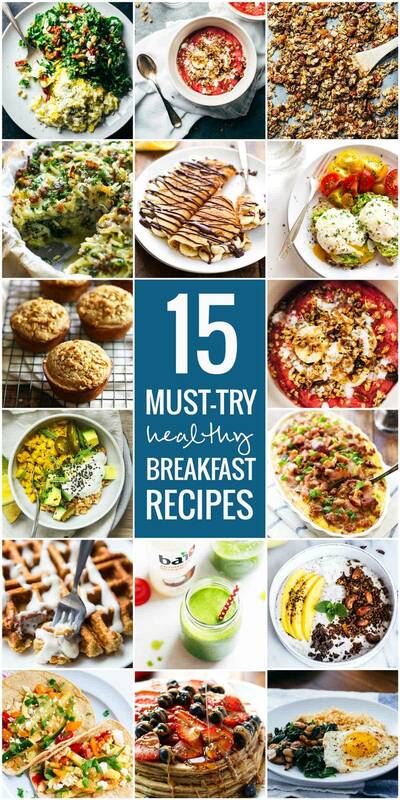 15 must-try healthy breakfasts – ready, set, go! Who knew that poaching eggs was so easy? The simplicity in this breakfast makes it an irresistible morning staple – especially in the summer with those fresh tomatoes. Ahhhhyes. This gorgeous breakfast bowl is quick, easy, and convenient. It keeps in little jars in the fridge for super healthy breakfast on the go! Made from wholesome ingredients and bright red raspberries so it’s filling and naturally sweet. Sometimes I, like, reeeeally love breakfast meats. Like sausage and bacon and ham, oh my. 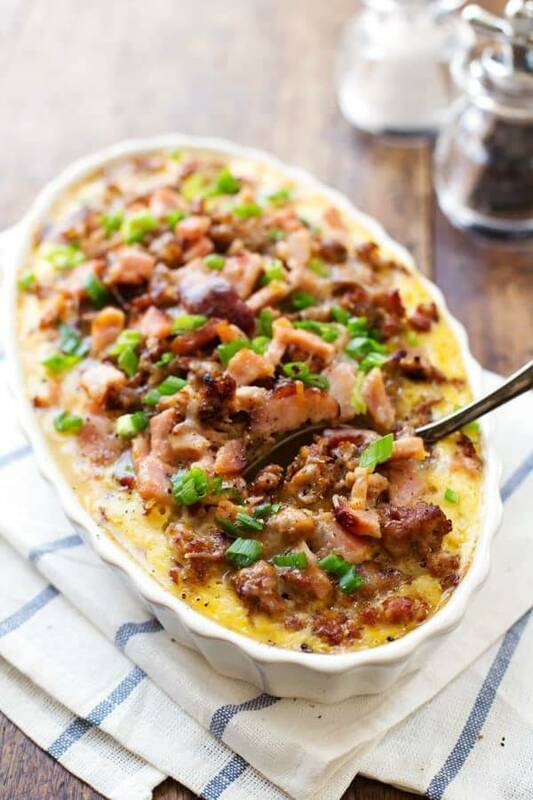 Here’s one protein and flavor loaded breakfast for your breakfast table – this would be perfect for using up that Easter ham! Hooray! Everything you want in a muffin is right here. 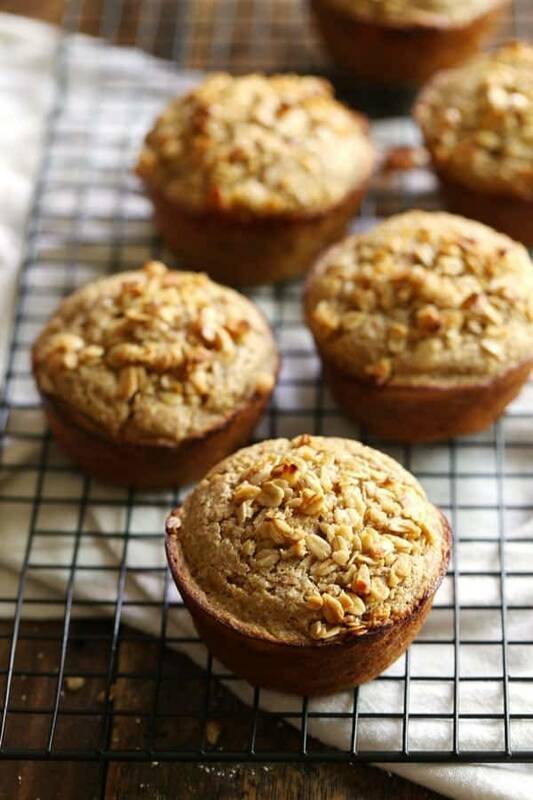 No refined sugar and lots of healthy grains, oats, and bananas in these golden muffins. These pancakes are the only thing my best friend can get her 2-year-old to eat for breakfast. And me too. MINE MINE MINE. Top this stack with your favorite fruit and you’ll have one powerful pancake breakfast! 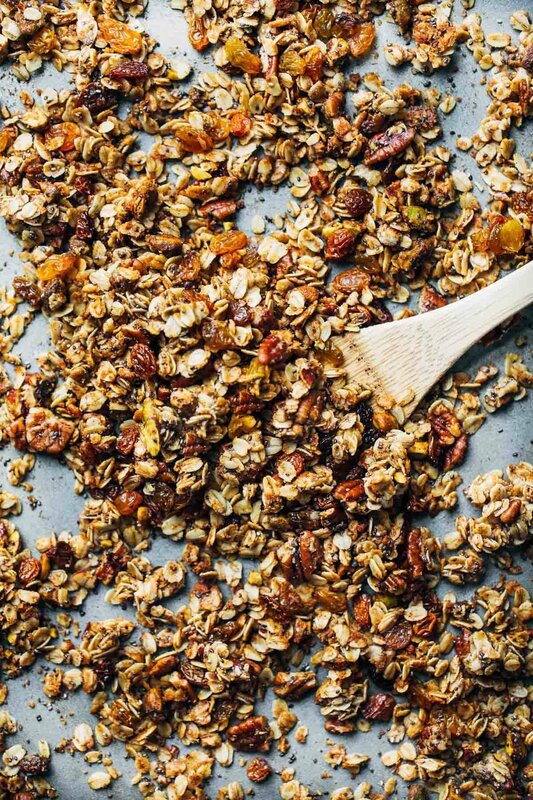 I could munch on this granola all day every day. Err, wait, I already do. Serve it with fruit, yogurt, or milk and have a yummy and filling granola breakfast. This coming from the girl who doesn’t like scrambled eggs. But goat cheese is magic, I tell you. When you’re looking for something savory and loaded with veggies for breakfast, this is the one. And then I got fancy for breakfast! Made from almond flour and oat flour – so wholesome and good (and drizzled with Nutella). Green smoothies are the answer to all my vegetable woes. This one is my current obsession – frozen peaches, coconut Bai5, spinach, and flax. Mmmm. A filling and savory breakfast pie loaded with shredded potatoes, kale, sausage, and baked in a yummy egg and cheese blanket. So simple – only 6 ingredients, you guys. WE CAN DO THIS. This is probably the sweetest way I can think of to eat root veggies. But there are the carrots! And a little maple cream cheese glaze? Like, I can’t even talk about that because ♡♡♡. I love dressing up a plate of fried eggs with healthy and whole ingredients. Okay, am I the only one who notices the chocolate drizzled on top? hiiiiiii lover. The texture and crunch in this breakfast bowl makes it a whole food breakfast treat. The turmeric. The chickpeas. I am crushing on this delicious vegan and whole-grain rich breakfast big time. If you’ve ever wanted tacos for breakfast, first of all, you are my food spirit twin, and secondly, THIS is your recipe. Blueberry Muffins made with wholesome whole wheat, frozen wild blueberries, and honey. Fresh out of the oven with a glass of milk and a strong Americano? HEAVEN. Breakfast is by far the best meal of the day. I would gladly eat these breakfast recipes for breakfast + lunch + dinner every single day for the rest of my life! Yum!! Agreed! I try to eat over half my daily allowance of calories in the morning, I guess I’m just a hungry hungry hippo in the morning. The oat banana crepes look absolutely fantabulous. They stunned me when you originally posted the recipe and still look marvelous now. Yeah I can never understand those people that skip breakfast, it’s the best meal of the day! Thanks so much for including my waffles, Lindsay! I need those almond oat banana crepes in my life, stat. These look great! Do you have a list of everything pictured above so I can find them? Thanks! Opps! Now I see it, sorry! Disregard. 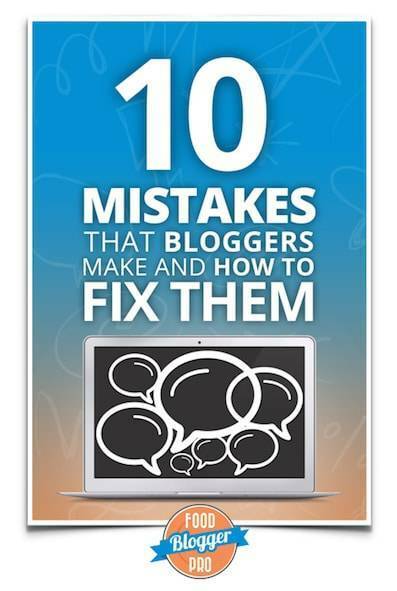 This is an amazing list! I want one of everything! I agree – enough with the oatmeal! These are great start-o-the-season breakfast ideas. Thanks! There isn’t a single one of these breakfasts that I wouldn’t LOVE to eat right now! I’m with you on the readiness for more spring-like breakfasts, and unlike many food bloggers out there, I just haven’t ever been much of an oats girl! All of your ideas sound and look to die for! Breakfast is by far my favorite meal of the day. And these look so AMAZING! The biggest problem? Which one to eat first! Thank you so much for including my breakfast tacos in your roundup, Lindsay! So many great breakfast options here. Breakfast is my favorite! Love this post!! I’ve been in such a breakfast rut lately. 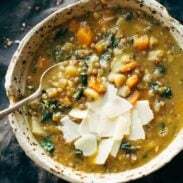 Definitely saving this post to try one of the recipes next week! I think I can have these dishes anytime of the day! Especially the ham and egg hash brown bake. Love hash browns! Great post! I found lots of ideas I like, so this will brighten up our breakfasts. 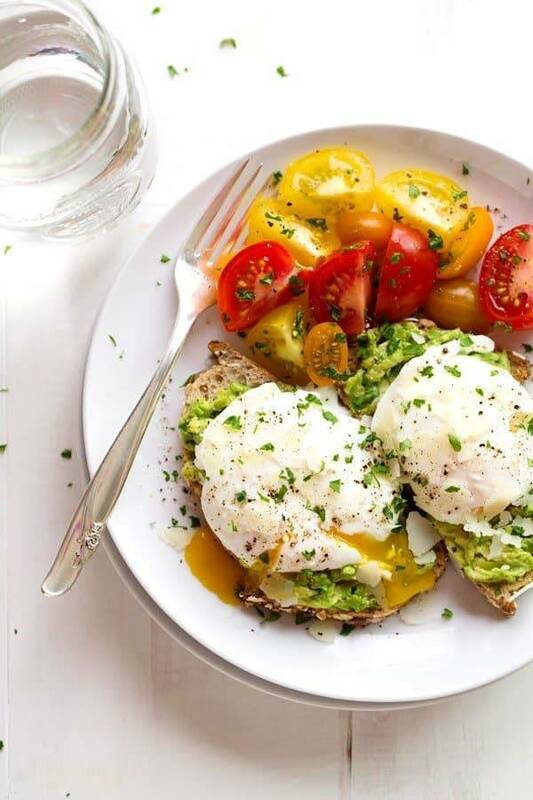 Those poached eggs on avocado toast look amazing! I would do that on a regular basis! Yummm! You had me at breakfast. My favorite meal of the day. 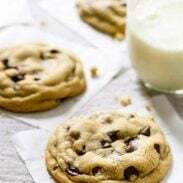 And these look scrumptious! I have to try some of these! Oh my goodness…my stomach is so growling and it is 4:00 in the afternoon. These all look amazing. Of course I am pinning like crazy! I’m super excited to get started with this list! I have to try the ALMOND OAT BANANA CRÊPES !!! Looks yummy! I pinned a bunch of these. And since we are a family that really digs breakfast for dinner a lot of these would make a great dinner. These all look so good. I have been eyeing the muffins since you posted them. I was going to make them this weekend but now those crepes. Maybe both?!?! If I absolutely HAD to pic a favorite recipe of yours photography wise, it would be the banana crepes. They’re SO beautiful!! Though I love the poached eggs too. And the goat cheese scrambled eggs?! Totally read about those in Bread & Wine. My obsession with that book is bigger than life itself. Lovely 🙂 The eggs and avocado are my shout, with hopefully some room for the cinnamon pancakes for ‘breakfast dessert’! Can’t beat an indulgent start to the day! I think I’ve just found my breakfast options for the next 15 days. Seriously though, these all look sooo delicious! Those banana crepes look divine, and the sausage potato pie looks heavenly too!